When I was a preschooler, we practically lived out our local library. We did the big summer reading program and spent at least one afternoon a week at the library. We loved it so much. In the fall they would do these afternoon preschool crafts. 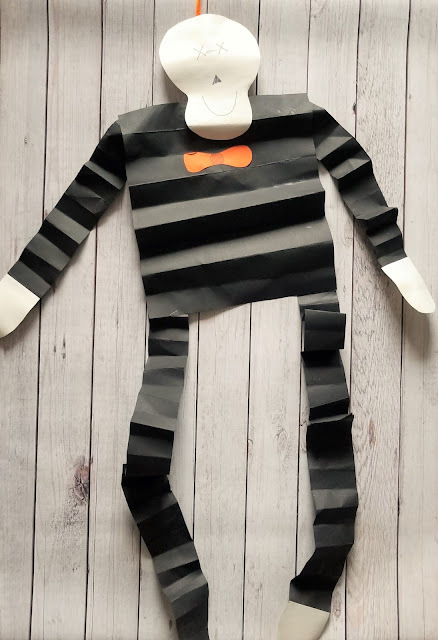 I don’t remember very many of them, but I do remember we made this super simple preschool skeleton craft. It was AWESOME! All 5 kids in my family made one and we took them home and hung them up until literally like 3 years ago. Why 3 years ago? Well, my mom had a devastating Halloween box mishap. It started with a couple of gourds that she kept that ended in a big molding stinky mess that ruined all her Halloween decorations. Including all our childhood Halloween and fall projects she had kept over the years. It was a sad day for all of us. And that meant no more hanging skeletons. But lucky for me. I remembered exactly how these cool skeletons looked and how we made them. 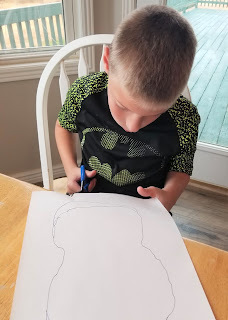 Which meant I was able to recreate the template so that my own children could make some and hang them up in our home. It is a super easy craft. All you need is a few pieces of black construction paper, white construction paper, a scrap of orange paper and glue and you are set to go. Print out the skeleton template. Just click and print. Super simple. Cut out 1 skull in white construction paper. Cut 2 hands and 2 feet in white construction paper. 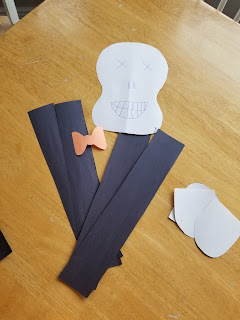 You can cut the skeleton template out of cardstock and have them trace it like a stencil onto the construction paper. That way you don’t need to print out more templates and waste paper. 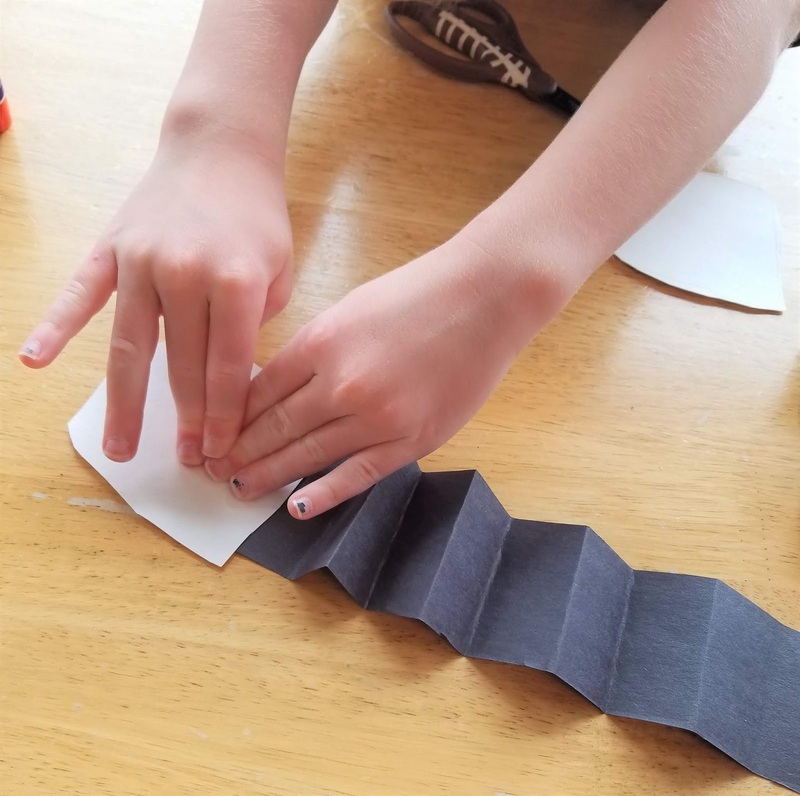 Take one piece of black construction paper and cut it into 4 equal rectangles that go lengthwise. These will be for the legs and arms. You want them to be long. It may be easier to fold the paper in half and than in half again. That way there are lines to follow and cut. Cut out the bow in orange construction paper. Take the arms and legs and fold them accordion style like you would a paper fan. This is probably the hardest step for kids since it takes a bit of patience and hand-eye coordination. You’ll probably want to help a bit or at least give a little extra guidance on this one. 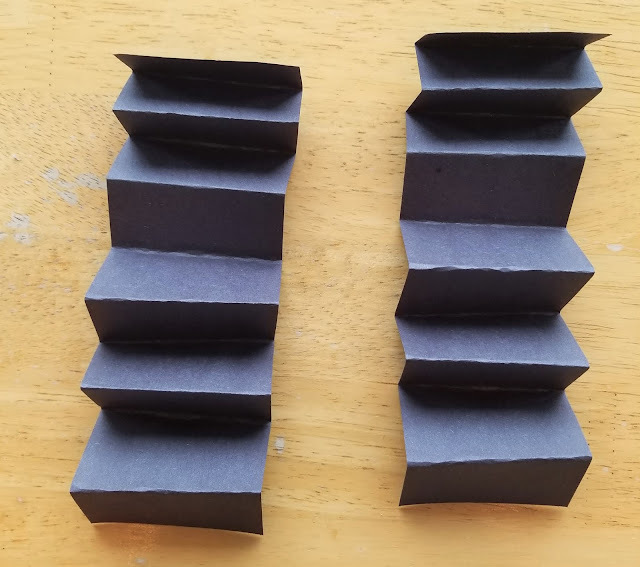 Fold the final piece of black construction paper accordion style. This will be the body of the skeleton. Remember it doesn’t have to be perfect. Glue the hands to the bottom of the arms and the feet to the bottom of the legs. Make sure they use a lot of glue so they don’t fall off after you store it and pull it out next year. Glue the arms and legs to the back of the skeleton body. 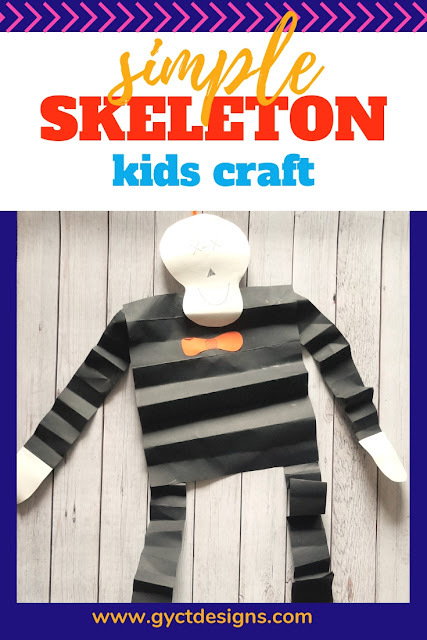 Make sure they write their name and the year on the back of their skeleton so you can remember how old they were and how much fun you had creating this preschool skeleton craft. Hang that skeleton up. They look great next to these fun Ghost Puppets. Now let me give you one warning about this craft. The best part is that you get to hang them up each year to display for everyone to see. 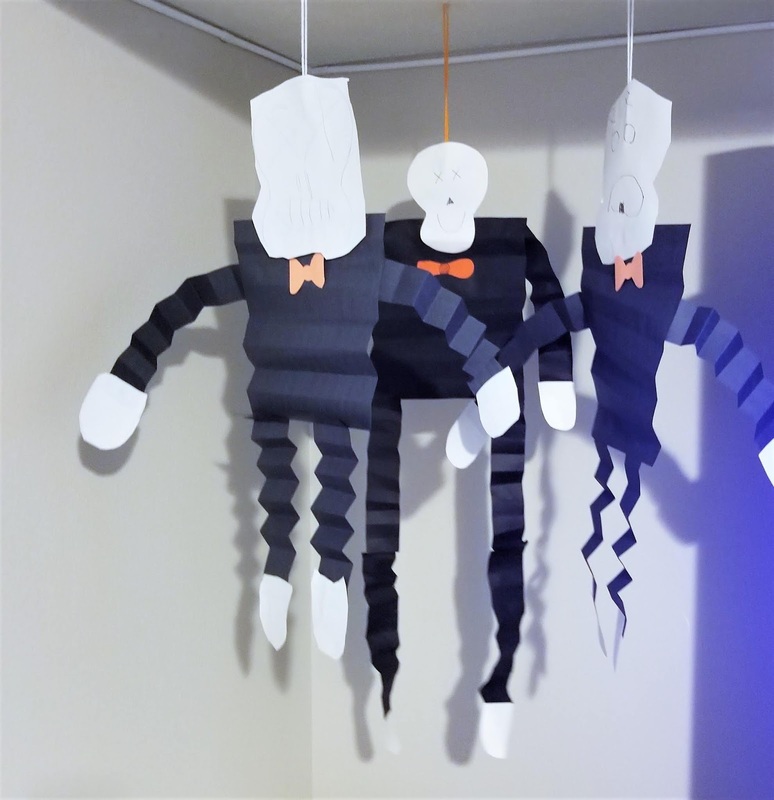 However, at night when all the lights are out and you walk downstairs and you forget that you have that awesome preschool skeleton craft hanging from your ceiling, you might suddenly go into fight or flight mode. This is totally normal. It happens to the best of us, but just remember….it is just a craft. Nothing to alarm. Just pick a better spot to hang it than right at the bottom of your stairs. Can you see that I’ve had a run in or two with these hanging skeletons before? Just imparting my “wisdom” so you won’t end up in the same terrified boat as me. I totally love this preschool skeleton craft. Obviously, since I’ve remembered for the last 20 some odd years. 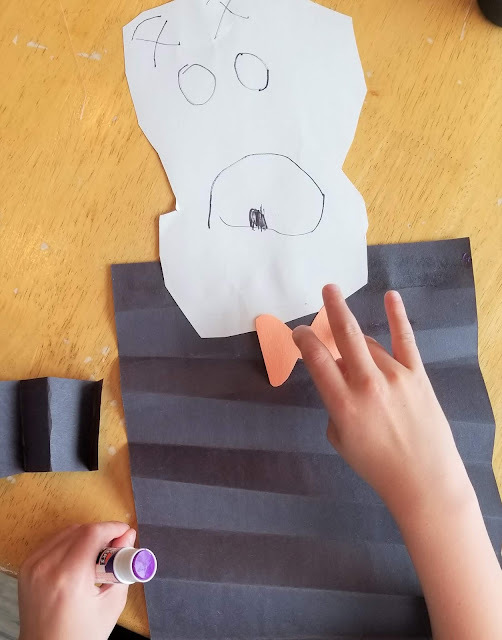 I was also excited to do this craft this year because my kids really love the movie Coco. And they have gotten way into skeletons and Dia de Muertos. So this was a super fun project for them and they loved designing their own skeleton. Do you enjoy Halloween? 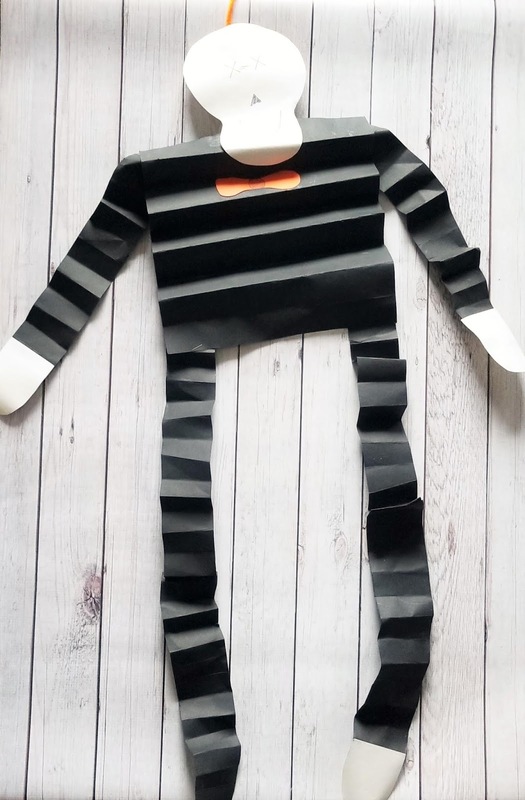 Check out all of our great kids crafts and Halloween projects.